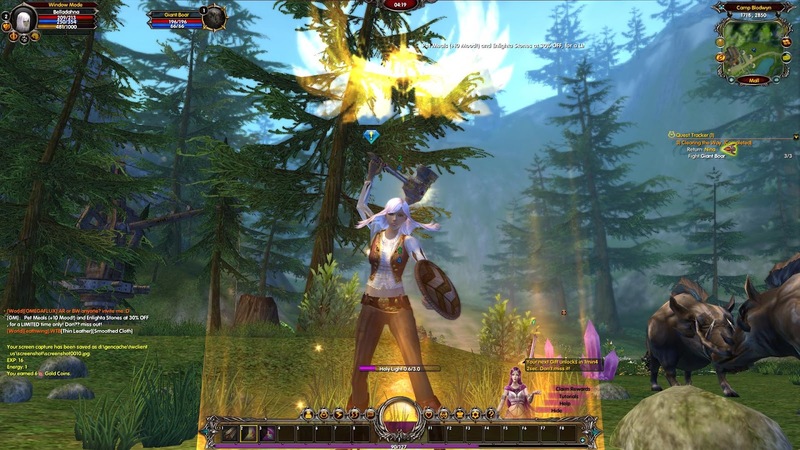 This week I have been puttering around with a newer game called Moonlight Online. It's a basic themepark MMO which has humans, werewolves and vampires. So if that's your thing it is kind of cool. There are transformation abilities too, but they are sort of limited and require resources to regenerate. The thing about this game is that it is only available (western version) on Facebook. If you're interested the app can be found here. You can play it in HD and also full screen, much the way Free Realms works. I'm not big on playing games through FB but on occasion I will. The game has mounts, pets, cooking and fishing. It also has the holy trinity. I've seen a fair amount of people playing it thus far, I'm level 12. There is a cash shop, I'm not sure how expensive it is, I briefly peeked in it. Lots of daily rewards for logging in every day as well as playing for 5, 10, 15, 30 and 60 minutes. Nice xp scrolls too, as rewards. So far I've gotten a seven day mount and a ton of scrolls. You get those pretty early on. The combat is pretty fast paced and the game really explains things to you. It isn't anything groundbreaking but if there is anything I love to do it is try out new games. It is always exciting to explore a new world. That's about it, as I haven't really gotten into much of the game past leveling a bit and a tiny bit of crafting which is a lot like WoW. I do see people looking for groups quite often. Sharing some screenshots. Safe adventures! That looks pretty amazing for a Facebook game. Might give it a look when I get game time again. Yeah, for a FB game I'd have to say it's one of the coolest I've played. I don't play many but I've tried a fair amount of them, heh. Seems pretty decent, there is an eastern client but over here we can only access it from FB as of now. It actually has higher graphic options, I I didn't turn them up since I was mostly fooling around in the browser with it.